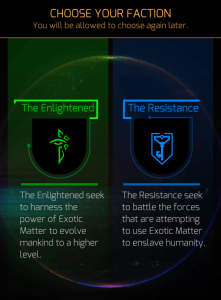 Ingress agents belong to one of two factions (teams): the Enlightened and the Resistance. The two factions have differing philosophies regarding exotic matter, the Shapers and the N’zeer, but their in-game abilities are the same. New Ingress agents are required to choose a faction. While there are ways to change faction (such as recursion upon reaching level 16), it is best when starting out as a new agent to choose your faction with the intention of sticking with it. Without a friend who is already an Ingress agent, many agents choose the faction whose philosophy most closely mirrors their own. Some ask around to find out which faction is the underdog in the local area and choose based on that. Some just go with their favorite color. Ultimately, the faction you join is a personal choice. Only you can know which one is best for you.